On 26thJanuary 2018, a sunny but cold winter’s day, Gwen Richards and Ian Evans spent several hours in Torr Mor re-locating some noteworthy old trees, photographed back in 2005 by Robin Noble, using prints held by Gwen. 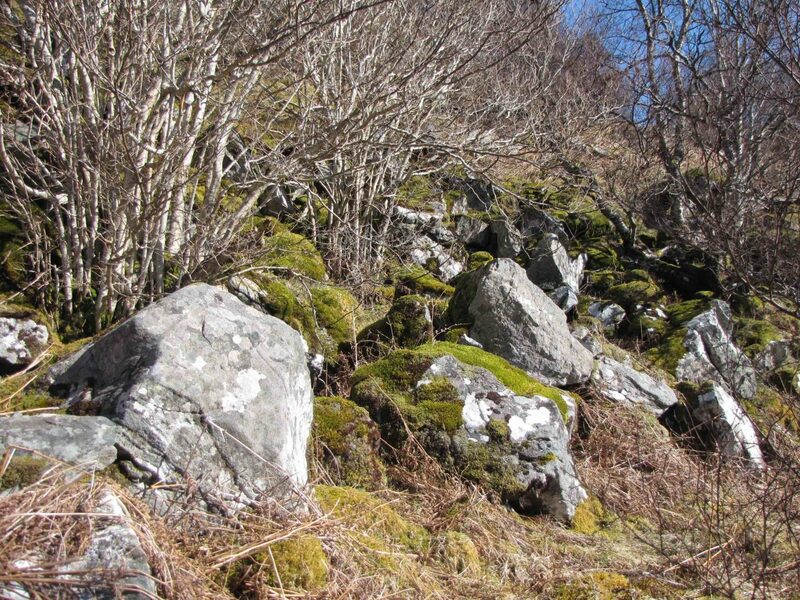 These included several groves of large hazels in boulder scree at the edge of south-facing glades (photo 1). 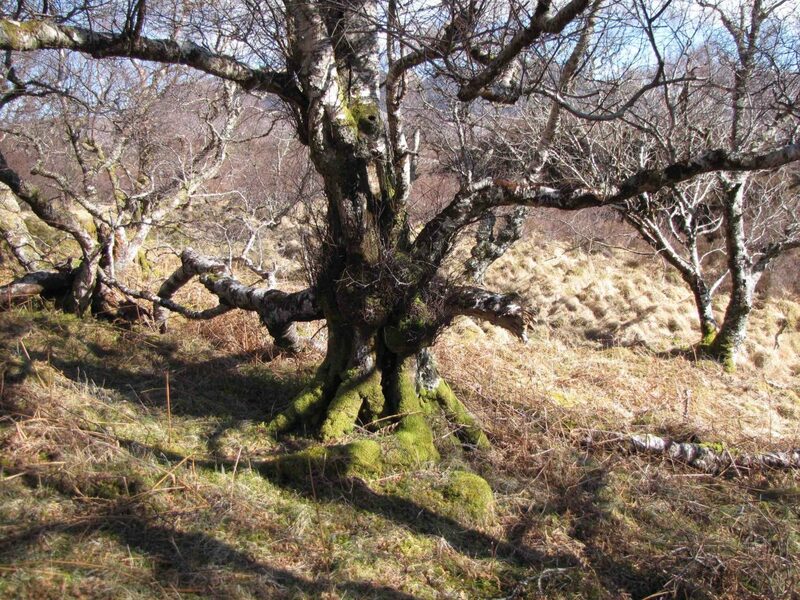 Amongst them is one ancient pollard hazel with a robust rowan trunk, at least 15cm in diameter, growing right down its middle (photo 2), presumably from a berry originally dropped into the crown. A welcome discovery, unusual in Assynt, was the presence, in places, of vigorous hazel saplings, showing regeneration from seed. One of these saplings bore the first big bud galls found in north-west Scotland; these are produced by the mite Phytoptus avellanae (see ‘Buds going nowhere’ on AFC website, February 2018). 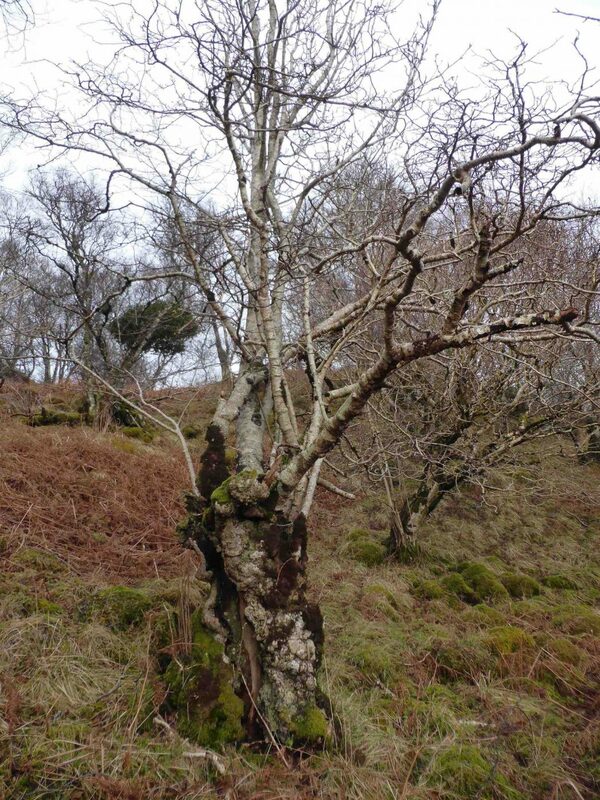 They also came across some huge rowans, a very large holly on a south-facing crag and, in an open area at the eastern end of the wood, some really ancient downy birches (photo 3). An incidental observation was of a hazel nut opened by a wood mouse. This item forms part of the Little Assynt Wildlife Project.